Large, multi-sport basket for roof rack, carry anything you don't want in your vehicle. Sturdy, weather-resistant, heavy-duty steel construction, black coating. Mounts to vehicle's cross bars with 4 universal U-bolts. Custom Wind fairing(made by steel) to reduce wind noise and vibration. Accommodating square cross bars up to 4-3/4" wide x 1-7/8" thick or round bars up to 1-7/8" in diameter. Dimension: 43" long x 39" wide x 6 1/2" tall Wind Fairing: 37" x 5 1/2"
Condition: New Material: Steel Color: Black 6-1/2" tall, 1" diameter side rails keep cargo in place Accommodating square cross bars up to 4-3/4" wide x 1-7/8" thick or round bars up to 1-7/8" in diameter. Large, multi-sport basket for roof rack, carry anything you don't want in your vehicle. 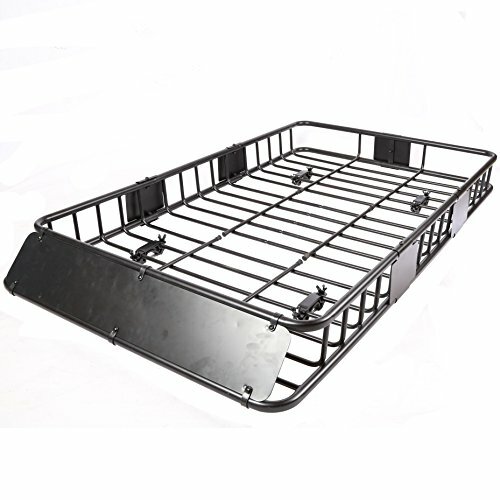 Sturdy, weather-resistant, heavy-duty steel construction, black coating. Mounts to vehicle's cross bars with 4 universal U-bolts. Warning: Never overload this rack! Though very durable, this external roof rack is not designed to protect the occupants of the vehicle in case of an accident or rollover. If you have any questions about this product by EGO BIKE, contact us by completing and submitting the form below. If you are looking for a specif part number, please include it with your message.